Keegan Bradley celebrates after sinking his par putt on the first hole of the playoff. 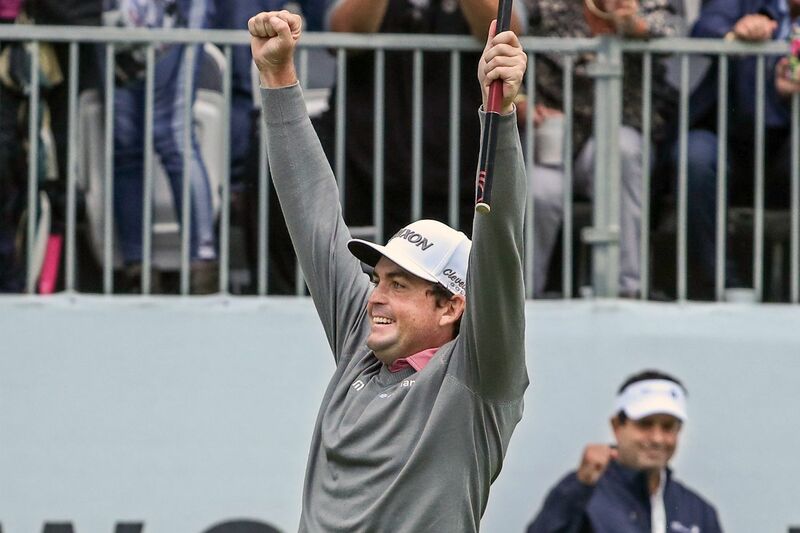 When it looked Sunday as if the final round of the BMW Championship would be rained out, Keegan Bradley felt good, knowing he'd be ranked 30th in the FedExCup points standings and assured of a spot in the season-ending Tour Championship. But gee, he thought, he was only 3 strokes out of the lead after Saturday's third round and playing well. Why not wait it out a little longer, come back to Aronimink Golf Club on Monday, and see what happens? Thanks to a bit of a break in the rain and an incredible job by the grounds staff at Aronimink, Bradley got his chance and made the most of it. He fired a 6-under-par 64, forced a playoff against 54-hole leader Justin Rose, and parred the first hole of a sudden-death playoff to capture his first PGA Tour victory in six years. Like his fellow competitors, Bradley sat around all day Sunday while the rain persisted outside. He called that day and Monday "the weirdest couple of days. "I knew in the back of my mind if we didn't play, I was in Atlanta," he said, referring to the Tour Championship at East Lake beginning Sept. 20. "It was my goal to start the year. "It was difficult to get ready to play because I was like, 'Man, if they call it, I'm good.' But then I can go out … I'm only 3 back. So thankfully we got out here and played, and I made it to Atlanta and more now." Justin Rose flips his putter after missing a par putt on the 18th hole that would have given him the championship. It was a week where the world's best players went low on a course softened all week by more than three inches of rain. Bradley, 32, who hadn't won in his previous 160 starts since his last win in the 2012 WGC-Bridgestone Invitational, was up to the task, carding 28 birdies, the most in the field. "I can't remember a week of playing so solid from start to finish," he said. "All week I played great." Playing in intermittent rain the entire day, Bradley and Rose each birdied the par-3 17th to get to 21-under. But Bradley's drive at the 18th went far to the left and he made bogey. That allowed Rose, playing in the last group behind Bradley, to walk up the final hole of regulation with a 1-stroke lead. But Rose came up short of the green with his second shot, and his chip checked up 15 feet short. The par putt looked good but lipped out on the low side, and he and Bradley would return to the 463-yard 18th and play it again. This time, Rose's drive landed in the left rough while Bradley found the fairway, and their approach shots both ended up on the right fringe. Bradley putted first and his ball stopped 18 inches from the cup. Rose's putt stopped 5 feet short, and his par putt sped by on the left. Bradley tapped in for the win, lifted his wife and son with a joyous hug, and pocketed a first-prize check worth $1,620,000. "It's so gratifying to get what comes with hard work," he said. "Sometimes you never get it. To be back here and win this tournament is just incredible." Rose picked up a consolation prize, moving into the No. 1 spot in the World Golf Rankings. He also will go to East Lake second on the points list. "The putt to win on the 72nd hole, man, that was about as good a putt as I've ever hit to try and win a tournament," Rose said. "That's about where the good stuff ended because on the playoff, [it was] a pretty poor hole in all." Horschel, the 2014 FedExCup champion, shot a 64 and finished in a tie for third with Xander Schauffele (67) at 261. Rory McIlroy hit 16 greens but made only two birdies and his 68 left him in fifth at 262. Tiger Woods was 1 shot out of the lead after nine holes but bogeys at the 10th and 14th holes hurt his chances. He finished with a 65 for a 72-hole score of 263, tying him for sixth place.